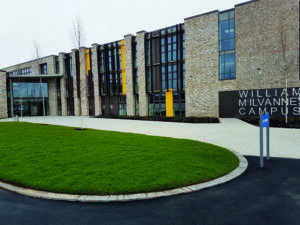 The new £45m William McIlvanney Campus in Kilmarnock comprises an amalgamation of Kilmarnock Academy and James Hamilton Academy into one campus, along with Silverwood Primary, New Farm Primary and the Early Childhood Centre. 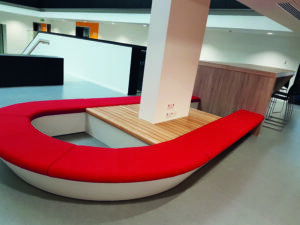 The campus will accommodate 1,465 secondary and 383 primary school pupils, as well as 80 morning and 80 afternoon early years’ pupils. 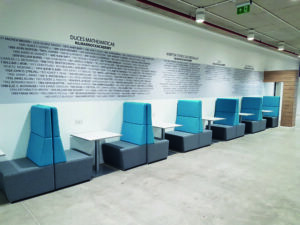 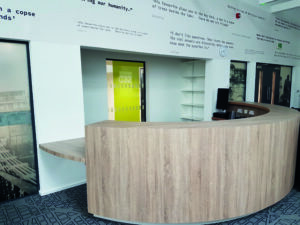 We supplied an FF&E package including a selection of bespoke reception desks in a mixture of laminated plywood and Corian®, display cabinets, upholstered wall and booth seating, shoe boxes, wall seating and bespoke bench seating shaped to resemble a boat.